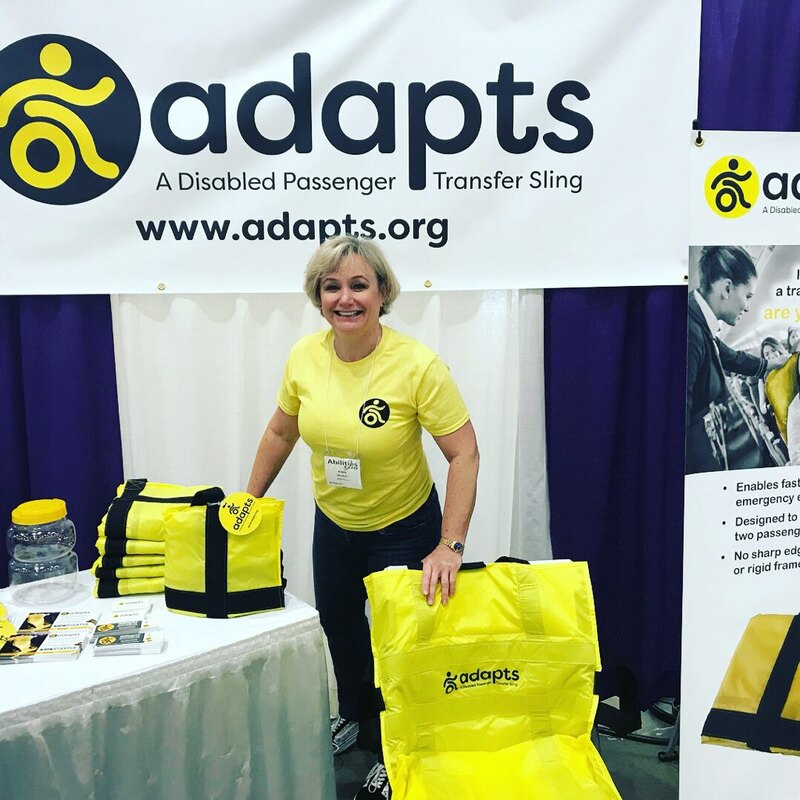 Although the Air Carrier Access Act of 1986 (ACAA, 14 CFR Part 382) prohibits commercial airlines from discriminating against people with disabilities and actually requires carriers to provide specific, “individual safety briefings” for passengers with a wide range of disabilities when they board, according to ADAPTS principal and inventor Robin Wearley, something has clearly been lost in translation over the years. Determined to do something to help make not just flying, but traveling in general, safer for wheelchair users the world over, Wearley channeled her unique skillset – a former flight attendant, Wearley also worked for 15 years as a cardiovascular surgery physician assistant and later as the manager of a team of medical science liaisons in the pharmaceutical industry – and invented ADAPTS. 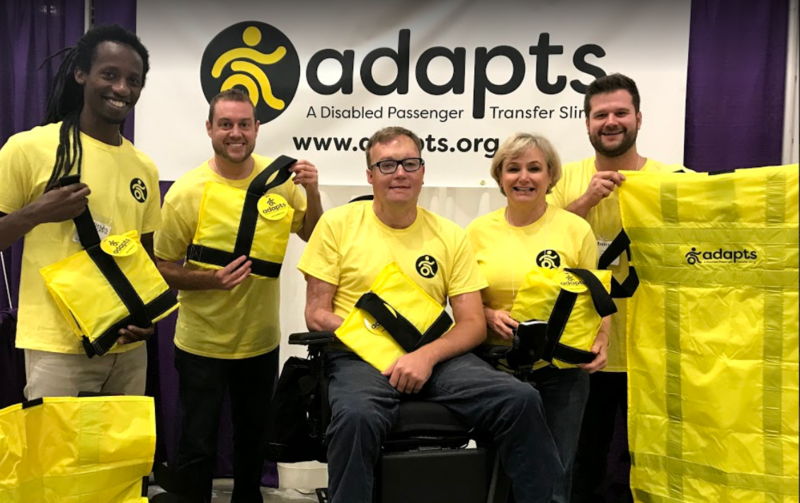 An acronym for A Disabled Passenger Transfer Sling, ADAPTS is designed for use by passengers with mobility impairment who wouldn’t be able to evacuate an airplane, building, or arena in an emergency without their wheelchair. 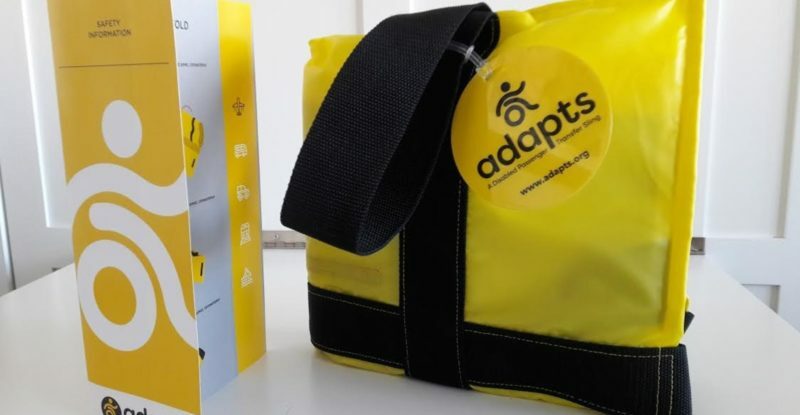 “As a former flight attendant, I also knew [ADAPTS] had to be easy to use and require no assembly when time is of the essence. 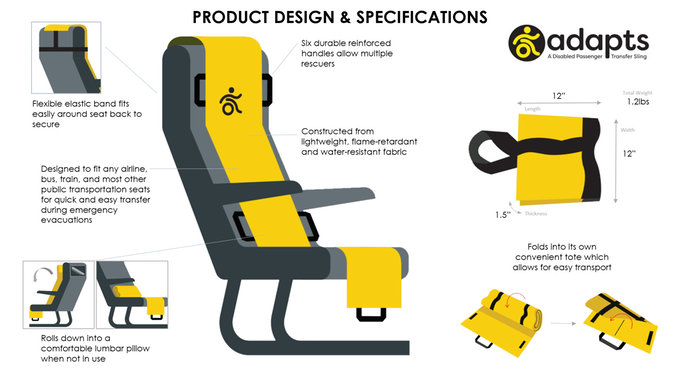 It couldn’t have any sharp parts that might poke a hole in the inflatable slide and needed to be lightweight for packing, flame and water-resistant, and it [also] had to be affordable,” says Wearley. Currently completing the regulatory and industrial testing required for labeling, Wearley says she is also presently working on getting FAA approval for ADAPTS. Currently gearing up for the next Abilities Expo in Washington, DC in early December, Wearley is also running a Kickstarter campaign to raise the $30,000 needed to produce 250 to 500 ADAPTS to sell online on the ADAPTS.org website, Facebook store, and in person at the ADAPTS booth at the upcoming Abilities Expo in Los Angeles in February. 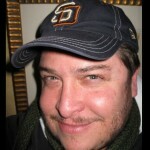 Running through 18 December, at press time the Kickstarter campaign is already more that 25% funded.